$5,000 USD IS READY TO BE PICK UP. This is very urgent'' I am DR.PETER ERICK, The new Chair person in charge of Western Union Treasury Department International wire money transfers of Benin Republic sing by Federal Ministry of Finance and IMF STOP ORDER OFFICE MANAGEMENT. You are to reply through this my official email address ( wunion9877@outlook.com ) or call for more information +2347065415663, This is to inform you that your fund was brought to my desk because the old retire director & management of the WESTERN UNION & MONEY-GRAM Transfer last year 2017 who have declared to divert your fund to the Government Treasury Account just because you can not pay for the wire TRANSFERRED Charge and SING REACTIVATE FILES Charge that holding your fund for easy get what belong to you. In reasoning wisely to this complain i told them to wait until i hear from you so that i will know the reason why you decide to reject such amount of money USD$2.7Million which is your rightful & legal overdue inheritance payment just because of Transfer fee and Reactivation Fee sum of $100 only. The reason why I sent this email to you is because its your sweat and for this reason you still have this last chance to claim your fund if you can send only sum of USD$100 today because i have already arranged your wires for its daily wires to you but failing to do this, i will allow them to have power over your fund and i am very sorry if you failed as this is the last chance neglect me but don't neglect my word OK, go ahead and send the fee as i instructed you and live the rest for me to get things finalize here. Therefore, send the USD$100.00 immediately you receive this email today and email your full name and address to me if you want your USD$2.7Million be send to you by Western Union Or Money Gram transfer but the maximum amount officially allow for it per day wire to you is USD$5000.00 per day until you receive your complete USD$2.7Million from here. The second option is for you to send me the full detail of your bank account if you want your fund be fully transfer by direct bank to bank wire transfer to your account at once. After you have sent the $100.00 and email me the mtcn numbers, you are to indicate your wish to receive your funds as i have stated above and the funds will be released to you without any hitch. Noted that only fee you are to send to them is for your fund Reactivate Files and Transfer fee it will no cost you more than $100 only that is all. for easy you pick up the first payment the sum of $5000.00 today as soon as possible you comply back with the instruction i give to you for immediately start making use of your first payment we already to send you today OK.
Now Listen Dear we the western union payment center have decided to forward your payment details which you are advice to use our western union website to Track it in your own SYSTEM COMPUTER or through Phone to see that your payment is available to pick up by receiver. FIRST OF ALL. Click on the western union website. 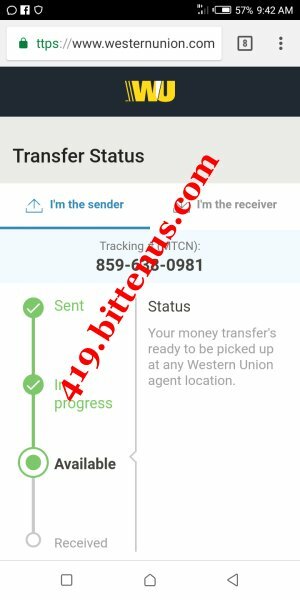 https://www.westernunion.com/global-service/tracktransfer it will show you on where to write the Mtcn,8596380981 , after that Click Contuine it will show you that your payment is available for pick up by the Receiver. Here is the western union or money gram information in the name of my accountant to avoid delay in receiving your fund and remember that I have done my best for you and i will make sure that your wire will begin to be released to you from the moment you sent this $100.00, as well. Send the $100.00 now and send me email with the Western Union Mtcn or money gram reference numbers when you send the money , you can as well call me on this number+2347065415663, when you have sent the money now OK . Receivers Name:. . Leslie James.